We are located in Attleboro, Massachusetts (near Providence, RI). If you are planning to be in our area and would like to visit; just let us know. If we don't have kittens at the time you contact me; I'll be happy to help you find a reputable breeder who does. Some of my friends have kittens closely related to my cats. 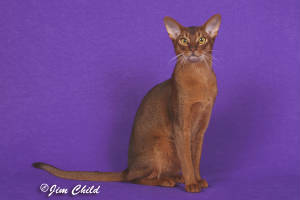 Welcome to my 35+ year love affair with Abyssinians. When my first Aby, the (not so) cleverly named "Sheba," arrived in early 1974, who ever knew I'd still be doing this so many years later? Her son, Mr. Fudd, was the first Aby man (well, neuter) in my life. As luck would have it, "Envy" came to live with me! 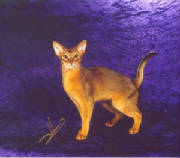 "Envy" was the Cat Fanciers' Association's Best Abyssinian, Best Cat - North Atlantic Region, and 13th Best Cat Nationally for the 2004-2005 show season. Envy had a second show career at almost six years of age becoming CFF's Best Cat for 2008-2009 and giving those judges the pleasure of seeing a fully mature Aby boy. Envy positively loved the shows and he was a great ambassador for his breed. Not only was "Envy" the best looking man in my life, but he was also one of the sweetest cat people I have ever known. He will always be the love of my life. Sadly, Envy died on August 21, 2010 taking most of the light with him. I am not going to be raising many more litters but I will still be happy to tell you about Envy and to refer you to friends who do raise Abys and some of whom have Envy's descendents.